OK, in another blog of mine, I shared a cool idea of something you can do with old Christmas tree lights - or at least their bulbs. 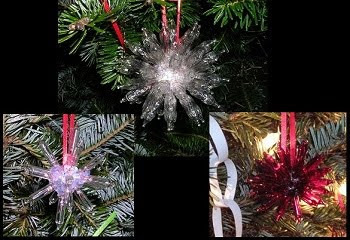 Anyway, if you happen to have some clear plastic beads on hand, an arrangement of these, glued together can replace the balled up piece of tin foil as the core of your ornament. 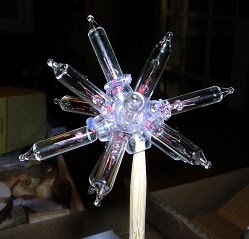 I glued 7 clear beads into a symmetrical shape (As you can see in the photo, I started with 3 in a row, then added 4 more around the middle bead.). 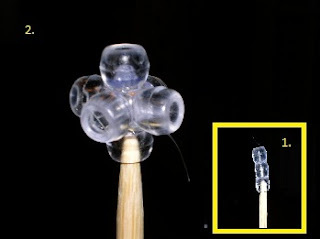 Once you begin adding your bulbs to the ends and at the intersections between beads, the variations in this shape allows the light bulbs to extend from the center at different heights. I think it makes it look more interesting than just a sphere - more Moravian star- or snowflake-like. Don't forget to include a ribbon (or string or wire) as you glue in the final bulb, and you're done . . . well, apart from waiting a few minutes for it to dry before you hang it on the tree. Also, try using colored bulbs, and see how you like them. I'm not sure I'm going to put all these away with the Christmas ornaments when we take down the tree. These might be cool as light-catchers in my windows year-round!